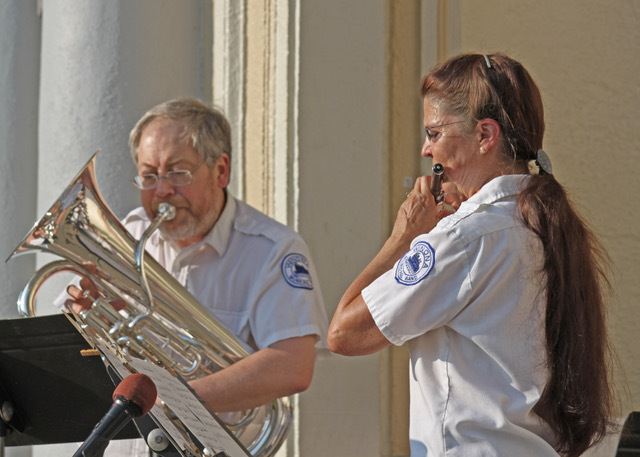 The husband-and-wife duo of Janet (piccolo) and Eric Heukeshoven (euphonium) will perform “Birdie’s Favorite" at the free Winona Municipal Band concert on Wednesday June 27, 2018 at 8 p.m. in the Lake Park Bandshell. The music was commissioned for the Minnesota Ambassadors of Music 2018 European tour. Director Levi Lundak will lead the ensemble for this premiere performance. It has been estimated that between 1889 and 1930 well over one thousand piccolo solos were composed and performed in outdoor bandshells across the USA and in Europe. Eric Heukeshoven adapted and arranged “Birdie’s Favorite” from an original solo for piccolo and band by John S. Cox – one of John Philip Sousa’s most renown piccolo players. Following their Winona Municipal Band preview, the couple will perform the duet with a select group of high-school age musicians from throughout the state as part of the Minnesota Ambassadors of Music 2018 tour. The Ambassadors concerts will take place in London, Paris, Switzerland, Austria, and Germany in July. The Heukeshovens are both long-time members of the music faculty at Saint Mary’s University. Janet Heukeshoven is a member of the River Arts Alliance. To learn more about the benefits of membership, please visit: riverartsalliance.org/JOIN.